The Diablo series has long been revered by gamers in large part due to the innovative, unique playable character classes available to the player. Diablo II Overviews often commented on the replayability offered in Diablo games. The Amazon, Necromancer, Barbarian, Sorceress, and Paladin were joined in the Diablo II expansion by the Assassin and Druid. Each class had its own play style, and role in a party. The announced Diablo III characters hold to this tradition. There are four that have been revealed to date, with one more due to be unveiled by Blizzard in the future. They are the Barbarian, the Monk, the Wizard, and the Witch Doctor. Each has its own strengths and combat style, and although Blizzard originally meant to have each class be available in a single gender, they have confirmed that all Diablo III characters will be available in either gender. This Monk is Only Obsessive-Compulsive About Annihilating Evil. One of the most interesting Diablo III characters to be revealed so far is the Monk. An interesting sort of cross between the old Paladin and Amazon classes, the Monk specializes in close in annihilation of any beasts or demonspawn in its path. Crippling Wave – a surge of close range energy that does damage in a close arc around the Monk. Impenetrable Defense – a shield of energy that reflects ranged attacks back at the attacker. Exploding Palm – the Monk’s fist unleashes explosive energy, dealing heavy damage to one foe. Seven-Sided Strike – a devastating area of effect technique, the Monk launches strikes on enemies from all angles. 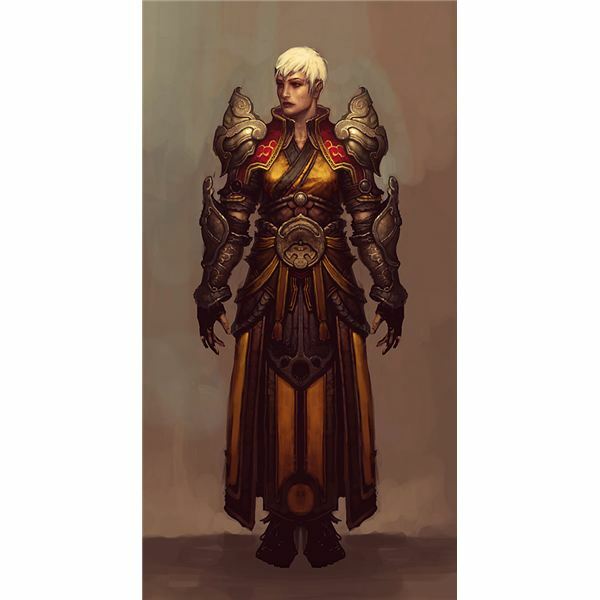 Way of the Hundred Fists – deals crippling damage to a target in front of the Monk. For gamers who like to get up close and personal with their enemies, the Monk will be a Diablo III character to consider. The Barbarian is Back in Town…and Surlier than ever. The only character class to make the transition from Diablo II is the Barbarian. A lethal brawler, the Barbarian is concerned only with dealing maximum damage, not finesse or subtlety. Taking on some of the more armored characteristics of the Paladin, the Barbarian is still a tank, first and foremost. Lots of hit points, lots of armor, the Barbarian takes on one enemy or many with equal aplomb. Ranged attacks may be a weakness, but who needs to deflect fireballs when you can just laugh at the tickling warmth spreading across a torso the size of a truck? Cleave – your standard, run of the mill six foot arc of swinging death laid out in front of the Barbarian. Ground Stomp – think of the Tauren in Warcraft III: Barbarian stomps, enemies are paralyzed, and easy targets. Leap – imagine a semi truck flying through the air, then landing on a group of demons. Messy. Whirlwhind – Imagine a huge lawnmower with a 4 foot high blade cutting grass. This grass is legions of undead. 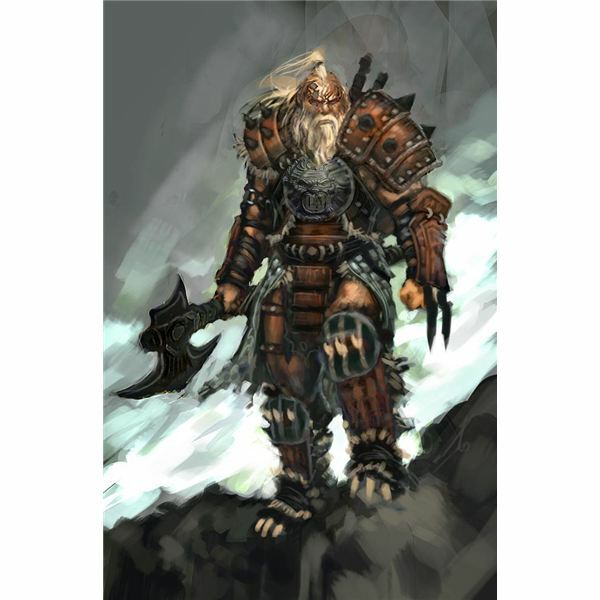 If pure carnage is your objective, then of the Diablo III characters the Barbarian may be for you. Sorry Dorothy, Water Won’t Melt Diablo III Characters. A straight up magic user, of all Diablo 3 characters so far revealed the Wizard appears to be the most conventional. Of course, appearances can be deceiving, and the Wizard boasts a surprising complement of close range capable techniques that will (literally) shock unwary opponents. 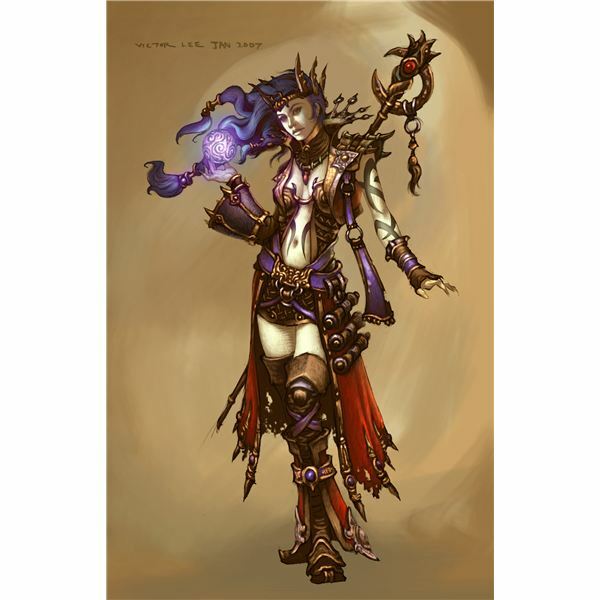 While the Sorceress of Diablo II was very vulnerable to close range assaults, the Wizard has been given a wide range of spells and techniques guaranteed to make life miserable for any swarmers hoping to exploit the former disadvantages of the Sorceress class. The Diablo III Wizard is not to be trifled with at any distance. Disintegrate – a long range beam death. It takes a moment to do its work, but any enemy in a line is vaporized. Electrocute – chain lightning at its finest. Arcing electricity travels between enemies standing too close together. Teleport – getting mobbed by foes? Tired of fighting resurrected imps? Just blink, and you’re somewhere else. Magic Missile – just like arrows, but made of focused magic. Beats working out to be able to draw a bowstring. Slow Time – create a bubble of space time where everything…time…slows…down. Makes dodging a tad bit easier. For anyone with an interest in the arcane, take a gander at the Wizard. Take a pinch of Necromancer, add a pinch of Sorceress, and you end up with the most unique of the Diablo 3 characters yet announced. A magic user who knows that the best attack is one you have someone make on your behalf, the Witch Doctor is one interesting addition to the Diablo series. It is difficult to say how the Witch Doctor will be best utilized. The old Zoomancer abilities used by gamers who liked to form an undead army with their Necromancer may have been somewhat nerfed by Blizzard this time around. 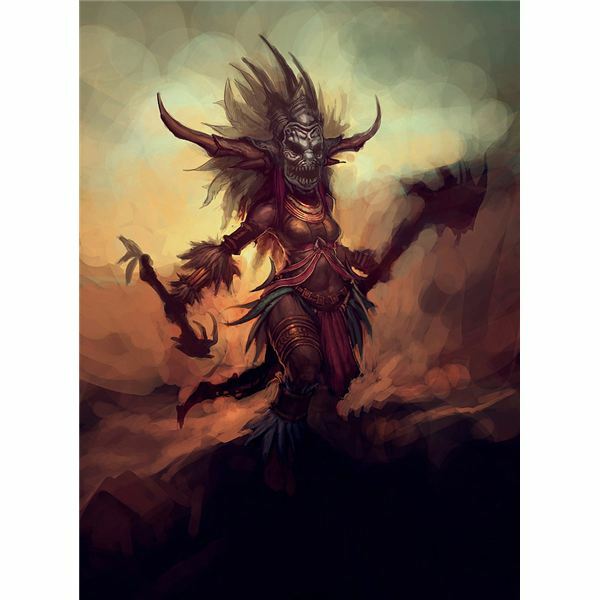 The best players may find a sweet spot in the combination of spells designed to sow fear and confusion among enemy ranks and summoning ability offered by the Witch Doctor. Horrify – causes enemies to run in fear, driving away mobs of opponents and making them vulnerable to attack. Locust Swarm – similar in concept to chain lightning, summons swarms of locusts to devour enemies. Mass Confusion – causes a messy fustercluck among enemies, who turn and slaughter one another. Soul Harvest – destroys enemies in an area, returning energy to the caster. An interesting character class in Diablo III, the Witch Doctor’s strength appears to lay in subtle attacks and rendering support to a party. Blizzard has revealed a wealth of information surrounding four of the five Diablo 3 characters, but clearly there is much more going on that will be announced as the Diablo III release date approaches. For gamers who have trouble waiting, Diablo II overviews can offer some clues to what may be coming by taking a close look at the characters in that game, and recognizing that Blizzard is taking pains to make sure Diablo III is a worthy successor to Diablo 2’s legacy. Expect more juicy details out of Blizzard relating to Diablo III characters in the future.